You could be an owner of a dog who was raised in a Puppy Mill. If you got your dog from a Newspaper Ad, there's a likely chance the puppy was from a puppy Mill. Puppy Mills are breeding factories where dogs are bred over and over again until they collapse and die. 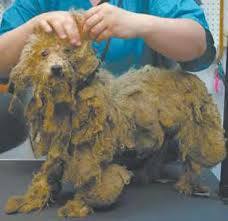 The dogs in puppy mills never recieve vetinary care, and have never seen a bed, treat, or toy. The puppies are often killed. Dogs in the mills are stuffing in wire cages, and given little to no food. Females are given just enough food to breed over and over again until they die. Scince puppy mills are a business, facilities are designed for profit, and not for the well-being of the dogs like they should be. The law says that animals should recieve a certain minimum of care, but Puppy Mills navigate around these laws my either selling directly to a customer or simply avoiding the reach of law enforcment. With no inspections or fines, it's easy to stay in business. Do I Own A Puppy Mill Puppy? If you ever buy a dog from a newspaper or off the internet, ask about the breeder and preform a follow up call. If possible, see the mother or the rest of the litter. Always keep your eyes open for a clue that your dog might be from a puppy mill. 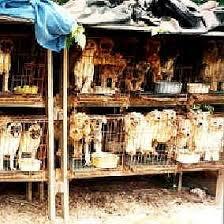 The pictures may be small, but they're big enought o give you an idea of what goes on inside a puppy mill. Your preaching to the choir here. But yes,mills are horrible places.Pet store puppies are from mills most times.The big pet store chains carry mill puppies.